In addition to the LED tap lights I’ve made, I’ve also received requests for some custom LED lighting applications. I usually use bright white LEDs or the bright blue LEDs for these projects but have many other colors to choose from. For most of these applications a very special circuit was designed to run the LEDs at a “constant current”. 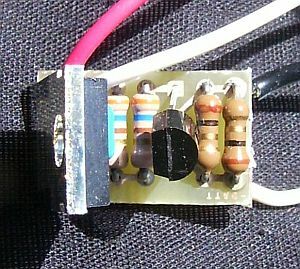 This provides a constant amount of light to the LEDs for a longer period of time and allows the LEDs to run on voltage from 4 volts to 12 volts. This means you can use multiple sources of power… even a car battery! 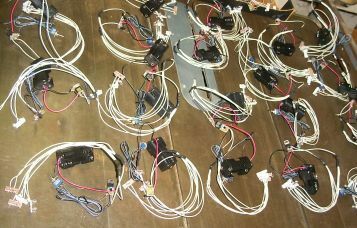 Here a customer requested a lighting solution for 50 table displays. Each table would have a trophy that would need to be individually illuminated. Below is the prototype and the finished units (a few of the 50 that were ordered). 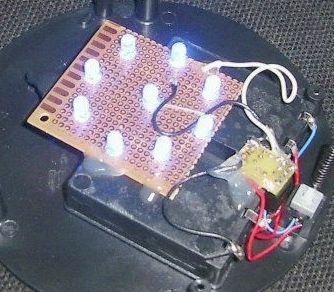 An LED light circuit with a bunch of LEDs with their noses ground off. 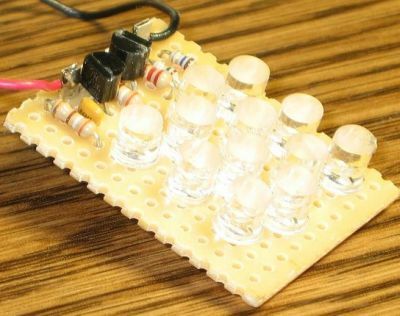 This diffuses the light and allows the LEDs to project light in a wider, more uniform pattern. Paul, interesting project. Unfortunately I don’t have time to review it right now. Please keep us posted with how the project develops. I am an architect in NY and am currently working on an installation. I was wondering where you were located, and if you were located in the New York City area, would you be willing to do a custom LED lighting job for me? 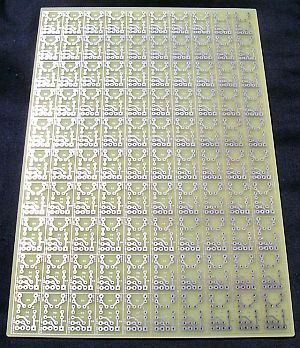 I’m basically looking for a board that is approximately 2’x11′ and has a pixelated/grid-like arrangement of red LED’s equally spaced 3″ apart across the whole board. Please let me know as soon as possible whether or not you can do this. If not, can you recommend anyone in the area? To add to these comments above, I would like to talk to you about a custom LED project I am designing. I plan to make a chandelier and auction it off for charity, but I’d be willing to pay. Please email me. Hi. I need 2 circular disks (if you can do that, not super imoprtant if that is the shape of the base), VERY sturdy, with 2 led lights on each. The lights basicaly need to be 3/4 cm long rectangles as narrow as possible but not more than 2-3 mm. They should look like 2 eyeballs (red please), tapered up at eithor end with pupils in the middle. These need to be connected to each other by wire with a single power source.I would like this this device to have a long baterry life (1-2 yrs. This device will be running constantly, so I don’t know if it could do that.) Smaller lights with no pupil will be fine in order to save power. What do you think? hi sounds like you;re super busy, well i have a request, I am a small business owner just got my tax id number so got a ways to go but i’m gettting jobs left and right, people seem to like my style i guess, but i need led technology. i would be more than happy to put your name on it. if you’re interested i will send you some more info and pics, btw i need them for my computers and some other creations i’ve been dreaming up. thanks! 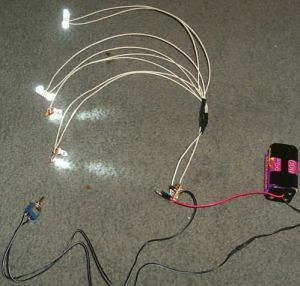 I need to make a white LED Head lamp for my motorcycle which is on a 6V 14AH system. The headlamp is a 14cm diameter perfect circular one. These are not available in India and hence the need to make one. 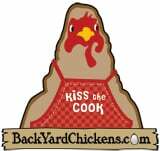 Could you suggest a circuit diagram.